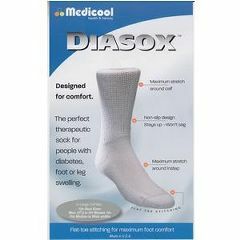 The perfect therapeutic sock for people with diabetes or foot and leg swelling. Comfortable fit for people with medium to extra wide shoe widths, features maximum stretch around calf and instep. Non-slip design stays up without binding or leaving marks. Flat toe stitching for a seam-free feel. Antimicrobial fabric treatment protects against fungal growth and bacteria. Contains: 88% natural cotton, 10% nylon, and 2% spandex. One pair. Please note: The medium size is designed to fit a Mens sz: 6 1/2 - 9 1/2 and Womens size: 7 - 10. Medium to wide widths. Please choose sizes accordingly. Socks are loose are overs. sized and bad fit. Very disappointed in the sizing of these loose fitting socks. Sized 9 1/2 to 12. I wear a 10 1/2 shoe. Tried on sock and the heal pushed right out of the shoe back, not a good look. Do you have the DIASOX sock in black, large and extra-large?